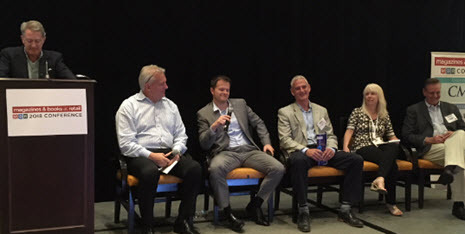 In a review and wrap-up panel at the 2018 MBR Conference, publishing and distribution channel executives unscored the importance of not just continuing, but accelerating, the pace of collaboration and innovation on a number of fronts. The session was moderated by John MacKethan, VP and GM Magazines, National Geographic Partners. The panelists agreed that the past year’s summits and other meetings with retailers are a positive development — as is the availability of strong, new data and presentations to bring to the table (including the “What If We Leveraged Everything About Books and Magazines” presentation; the results of Miller Zell’s MBR-commissioned study; and the latest Front End Focus study). At the same time, some said that the industry’s first priority should be ensuring the stability of the supply chain. Ingrid Jakabcsin, EVP of procurement and distribution, TNG, agreed with the need to stabilize the supply chain as a priority. She and other panelists also stressed that a critical part of retailer outreach should be focusing on connecting with more senior executives in retail organizations. “The [publications category] buyers are in our court and want us to win, but some higher-ups are pressuring for other products at the checkout,” because they’re exposed only to negative press coverage of the category, and not to the category’s strong profitability and other benefits story, or its success stories. She also pointed out that the Miller Zell research confirms that store-within-a-store concepts could be important for publications going forward. One idea she floated: Trying to get Barnes & Nobles in a chain that’s popular with Millennials, like Target. Mike Herrington, EVP at CMG, concurred with the need to address the supply chain, adding: “But I also I think we’ve taken a quantum leap forward this year from last year’s conference. What I mean by that is I sensed a sincere, genuine [determination among channel partner executives] to collaborate and talk about our category to retailers in one voice. There’s a different spirit. Herrington also observed that during recent summit meetings with retailers, they have emphasized that publishers need to earn their display space by driving or participating in newer promotional platforms like social media and click-and-collect to drive consumer consumption. Matthew Swider, senior director newsstand sales, American Media, Inc., also reported being encouraged by meetings with retail category buyers, while agreeing for the need to reach out to more senior retail executives. He also suggested that the newsstand segment of the publishing industry should consider engaging in its own public relations efforts to get success stories and positives out to retailers and influencers. Jakabcsin stressed the power of success stories such as a custom bookazine tribute produced for H-E-B that sold out, thanks to the slain star’s avid fan base and unprecedented promotional support from the retailer, including digital billboards and online promotion. As a result, “H-E-B is excited about magazines again,” and saying that they want to do similar bookazine initiatives on a regular basis, she said. “That success story should be conveyed to every retailer,” Jakabcsin emphasized. “While it’s more challenging to try to do these types of promotions with national chains, some retailers are supporters of magazines, and would be very open to these.” The industry should develop more bookazine concepts that are keyed to specific retailers’ needs and audiences, she said. The growth of bookazines, which accounted for nearly a quarter of retail sales last year, should be a key part of the story conveyed to retailers and influencers — particularly given that their sales are not included in audit bureau-based press reports of newsstand trends, noted several panel participants. Cvrlje, noting Time Inc.’s leadership in pioneering the format over the past several years, said that he would encourage any publisher to consider bookazines, as long as they are prepared to invest in display for the publications. “That would be good for our category as a whole,” he said. Cvrlje also emphasized that in addition to focus on the supply chain and retailer outreach, “we may need to go to our bosses and say that an investment may be needed.” While new design prototypes coming out of the Miller Zell study are “wonderful,” he said, wholesalers have traditionally paid for mainline displays, and given their financial challenges, may not be prepared to invest in costly enhanced displays. It’s possible that both mainline and display financial models may need to be revised, he noted. “We should talk with publishers about investment in outposting and the merchandising and display materials needed for that,” added Largey. He suggested that publishers should also consider returning to some investment in successful promotional tactics of past years, such as polybagged premiums. “If we all take the concepts and determination generated [at the conference] this week home to [our] bosses, we will have accomplished something,” summed up AMI’s Swider.